The costume that I am submitting is worn by myself and three other friends. We are seniors at the University of Connecticut. It is hard to put an exact name on what our costume is but it can be best described as "scary little girls". Clearly this is not the stereotypical way college girls dress up for Halloween. We woke up Halloween morning and said, "let's be scary"! While taking a stroll through Good Will we found $.99 night gowns and $1.00 dolls. Those 2 things are what led to us being the scariest people at the party. People were asking us to take pictures of them and boys were telling us to stop looking at them. It was awesome. The costume was topped off by long black wigs and face paint. Fake blood definitely helps enhance the effect! 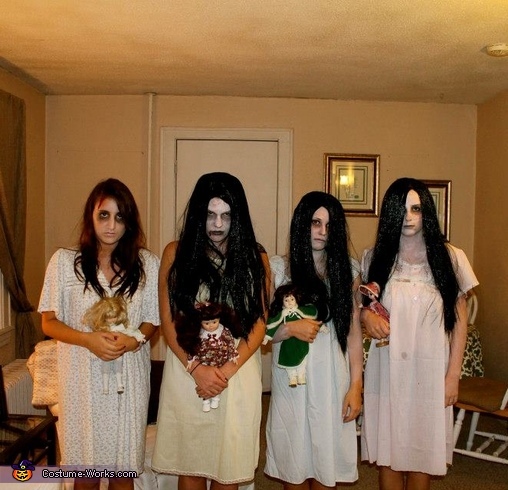 The following day in class people were talking about "the scary girls with the white faces and the baby dolls". This costume will definitely go down in the record books at UConn. I respect you guys so much for this exact moment. It was literally terrifying. Such a great idea! Absolutely loved this costume! These girls are so funny and definitely had the best halloween costumes this year!! AWESOME COSTUME!!!! favorite by far!! THIS COSTUME IS GREAT!!! So freaky, I want to be it for halloween next year!! Loved the costume! So creepy and pulled off well! The more and more I kept looking at these photo's the more and more chills ran up my back! Straight out of a scary movie! actually was scared... pretty awesome. This is the scariest, creepiest, greatest, most amazing and creative halloween costume I have ever seen. These girls were brilliant and horrifying all at the same time! this is the best costume I've ever seen! These girls are good.. These costumes were by far the best costumes at UConn!! BEST COSTUME EVER! So creative! This costume is amazing!!! Definitely the best costume this Halloween by far! Loved it! Everyone was talking about it for days! This was honestly the scariest costume I've ever seen at UConn... like not only did they dress freaky but they acted the part too. They were SO good! best costume i have EVER seen! great costumes!! best ones i saw! Such a creative idea!! The costumes looked great! I LOVE THIS!! So creative and perfect for Halloween. Seeing them on Halloween literally gave me the CREEPS! Best costume idea EVER! So good! Best costume by far! This is what Halloween is all about! This is the best costume! !